PONDERAY, ID. — Laughing Dog Brewing has every reason laugh now that it’s up 91 percent in Q1 over last year. Fred Colby confirmed that Q1 shipments nearly doubled in 2011 and Q2 shipments are already up 84 percent, a figure that Colby expects to see reach the 90 percent mark again after more shipments go out this month. “I just moved into a new facility and I already need more space,” he joked. Colby said that a good majority of his sales are coming from the IPA category, a statement consistent with current industry trends that have Pale Ales and IPA’s up 42 percent over last year, according to The Nielsen Company statistics. It’s a good thing Colby has five new 30bbl fermenters on the way to allow him to make more beer. After moving into a brand new facility, he hired three new employees to help carry the load and is considering bringing on a second crew once the new fermenters arrive. As if that wasn’t enough, Laughing Dog Brewing just recently became the first Idaho brewer to ship to Canada, with their first shipment leaving the states last week. 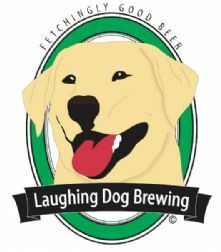 Laughing Dog Brewing produced 2300 barrels last year and Colby is projecting total production volume at almost 4,000 barrels for 2011.